The beach villa is double storey, 3 bedrooms all-ensuite, fully equipped with modern kitchen equipment, tastefully furnished living room and dining room, Flat screen satellite TV, air conditioning, sea view and pool view. Bahari Dhow, located directly on Diani Beach in Kenya, offers you the perfect combination of a simple and comfortable “home away from home” holiday hangout. The ideal getaway for a family or group of friends looking to relax, soak up the African sun without the limitations of a hotel. Ideally situated next to providers offering different types of activities from scuba diving to game drives to golf, and almost everything in between. 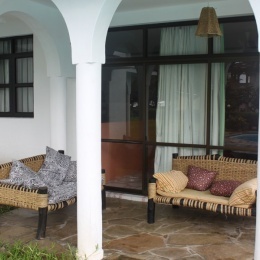 Specialty restaurants abound as well as ample shopping facilities spread along the ever growing Diani Beach. Bahari Dhow comprises of 24 fully furnished self contained, double storey villas, each with three large ensuite bedrooms, a fully equipped kitchen, dining and living room. All villas have pool views, while others also have full beach views or partial beach views. Feel free to have your own cook prepare your food at your own time or allow us the pleasure to prepare your menu of choice at your own time – breakfast, lunch and dinner. Had a great stay and we really enjoyed ourselves.